It all started with a simple sling. I remember the day vividly for it was like all others in those early days of my second child’s life. I was learning (slowly) how to manage both my 3 year old son and my 3 month old daughter and I was frazzled (at best) most moments of most days. While I reveled in the chaos of a two child home, I simply couldn’t figure out how mothers of multiple children did ANYTHING. It was in that period that I first came to understand what my own mother meant when she would occasionally lament, “I only have 2 hands!” And she had four of us! *** I interrupt this regularly scheduled segment to applaud my mother. You are a wonder, and I am still awed by the grace with which you parent and grandparent. “I only have two hands.” Would that God could give mothers eyes in the back of our heads, an extra set of hands, ears all around town … though I do marvel that our hearts are capable of expanding infinitely as each new babe is laid in our arms. Lacking two actual extra appendages, I couldn’t help but jump with glee when my own mother pulled off the shelf in Marshalls (yes, you read that correctly) a black canvas ring sling by Parents of Invention. I’d never seen such a curious article, but I promptly threw it in my cart and whisked it home. Anything that promised extra bonding time with my baby while allowing me to play with my little boy warranted a try. It was the beginning of the most glorious adventure. The minute my daughter pressed her little cheek upon my chest, her heart finding and matching the rhythm of my own, I transformed into a wrapping mamma. I’ve never looked back despite the collection of odd looks we’ll receive when we stroll about town united physically beneath a glorious tie-dyed Didymos woven wrap. Ah yes, I quickly moved from ring slings to woven wraps when my daughter was four months old. She’s nearly 15 months today, and we still wrap daily. I call my baby carriers my “magic wraps” because my precious girl falls asleep almost instantly when I “wear” her. 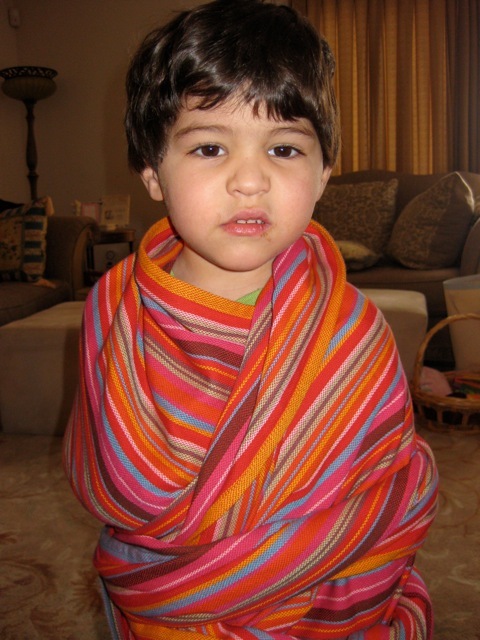 When she’s tired and ready for her nap, she’ll often trot over to our stack of woven wraps and pick the one she’d like to sport that day. Oh mammas. If you haven’t worn your child, you must at least try. Pop over to the best baby wearing community on line (www.thebabywearer.com) where you will find a forum that will answer the questions you didn’t even know you had about how to wrap, which wrap to choose, and why wrapping benefits both baby and mamma. You’ll find how-to videos there and on YouTube. You might even join a babywearing group in your area to connect with like-minded mammas who will tell you that worn babies experience a sense of security and love each time they view the world from inside a layer of fabric attached to their mamma or daddy. If cotton is the fabric of our lives, then woven wraps represent the fabric of our hearts. I don’t know if I will ever be able to part with the wraps my daughter and I use each day in these early years of her life. They symbolize all that we share now and the closeness I hope we will forever feel as mother and daughter. I only wish I had discovered wrap love when my son was a newborn, though he and I fortunately have other special ways to connect (books are the bridge by which our two shores are joined). 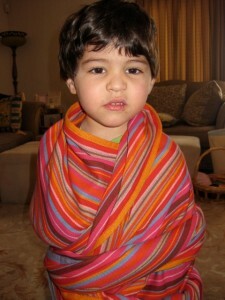 Nonetheless, my son gets his fair share of wrap love. Ever the prankster, he has taken to wrapping himself up like a mummy in my colorful wraps and parading around the house snarling at all who would dare cross his path. If you are interested in wrapping, be sure to buy quality wraps and slings and to learn proper babywearing techniques before attempting to wear a child. If done properly, babywearing will reward you richly. And for you mammas and dads who currently wrap, please post your favorite wraps and carries and tell us why you wrap. It’s a topic I never tire of discussing. http://www.kiddiecradles.com/ – Heather made me the most fantastic solar veil sling (made of a material that blocks much of the sun’s harmful rays). I’ve ordered multiple slings as gifts from her, and was so pleased by her care and attention to detail. 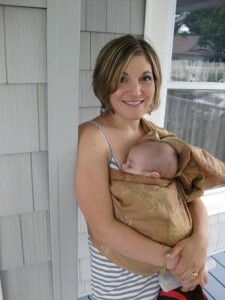 http://www.slingcarrier.com/ – Rosy Baby makes a “Lite on the Shoulder” Hybrid sling that features a pouch built into the traditional ring sling. I personally like the open tail version, as I find it more adjustable than the closed tail. My Rosy Baby sling combines high style with extreme comfort. Woven wraps are, admittedly, expensive; however, the quality of the fabric is such that you will have them for a lifetime. When you no longer use them as carriers, they can be used as stroller sun shades, picnic blankets, swings and hammocks (great picture here: http://community.thenest.com/cs/ks/forums/thread/33313093.aspx). Watch for sales on the various sites or keep your eye on the For Sale or Trade forum on thebabywearer.com ( http://www.thebabywearer.com/forum/forumdisplay.php?63-For-Sale-or-Trade). You must subscribe (it’s free) to the site first, but if you check regularly, you can often get a nicely worn in woven wrap for a song. Worn in wraps are actually better than brand-spanking new ones because they have more give and are much softer. You have made me a wrap mommy:) The one for the beach is the best! Please tell me where to look for one of these. How could an expectant mother not want to wear one of these after reading this! Well, Cara, you need not get one because something tells me you might be gifted one when the time is right 😉 You do, however, make a good point. I really should have given some good websites for other readers to find affordable and well made wraps and slings. I’m amending the original post right now.